Most international visitors that come from overseas don′t spend all of their vacation in the same spot. They usually want to combine several highlights in Central Europe in as little time as possible. Popular destinations for a combination with Salzburg are Venice, Vienna or Munich - as well as Innsbruck, the capital of the neighbouring state Tyrol. In the past, readers of Visit-Salzburg.net have e-mailed us to ask about public transportation and the best mean of transport between Salzburg and Innsbruck. There are several possibilities to travel from Salzburg to Innsbruck or the other way round. The distance between Salzburg and Venice is approximately 180 kilometres. However, keep in mind that there are plenty of very high mountains in between. This increases the travel time rather dramatically. Nevertheless, getting from Innsbruck to Salzburg is no big hassle from the logistic point of view, since public transportation is well-developed and trains often run several times a day. We have looked into various options for travelling. Let′s start with the good things: The train from Salzburg to Innsbruck takes you through some of Austria′s most scenic mountain ranges; trains run frequently (about hourly during business hours) and are usually direct ones that don′t require any changes; and they are convenient. Now the not-so-good-things: The route is far from being all that direct and takes you on a journey of more than 250 kilometres. This means primarily two things: The train journey from Salzburg to Innsbruck or the other way round takes relatively little time (two hours) because you don′t have to change trains, but costs relatively much money (almost 40 Euros for a one-way-ticket) because the distance is pretty large. If you travel on a budget, ask for special offers and discounts that you might be eligible for. If you are under 26, you might want to look into Interrail tickets or similar package deals that cover all Austrian or European trains at a lump sum. There are also railway cards available that cost 100 Euros for a year (only 20-odd Euros if you are under 26); they entitle you to a discount of approximately 50 percent on all regular railway tickets in Austria. Discount tickets for regional trains might be attractive if you don′t mind travelling for a much longer time than the two hours mentioned above. 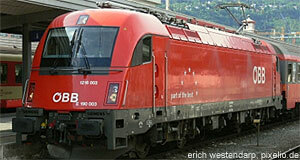 For further information, get in touch with the ÖBB, the Austrian National Railway, in either Innsbruck or Salzburg. The station is centrally located in both cities. There is the possibility to take scheduled busses from Salzburg to Innsbruck, but nobody would do that; a journey by bus would require several changes and we doubt it would be any cheaper than the train. There might be private bus companies that operate routes linking Innsbruck and Salzburg, but we have never come across any. Also not a very realistic option. Look at our train section above and think about it: Two hours from city centre to city centre by train. Versus: Driving out to the airport of Innsbruck or Salzburg, checking in, flying for what - 30 minutes? - getting off the plane, checking out, getting from the airport to the city centre of Salzburg or Innsbruck. Unlikely that you will manage all that in so much less than 2 hours that a flight would be justified. However, we know that many private aircrafts fly from Innsbruck to Salzburg or the other way round, especially during the skiing season. The rental car option is not fundamentally different for travelling between Salzburg and Innsbruck than for any other destination. There are of course all the major car rental companies present in both Salzburg and Innsbruck (two of Austria′s most touristy places). In both cities, most rental car companies operate offices at the airports and near the train stations. Several rental car companies also offer taxi services and shuttle transfers. If you consider taking a regular taxi, the taximeter will tell the set price. If you are clever, you plan in advance and get quotes from various companies. Now, a particularly clever move would be to google keywords such as "taxi innsbruck salzburg" not on your national version of google, but on google.at, the Austrian version of the world′s most popular search engine. Why is that? Because many of the small taxi companies in Austria have well-kept websites, often in both German and something resembling English, but they don′t rank well on international search engines because they have no funds for search engine marketing and no clue about it either. Looking up a few of them will cost you little time and might save you a lot of money. And keep in mind that especially in the skiing regions between Salzburg and Innsbruck, pretty much every village has a taxi company that has a lot of experience in airport shuttle services and transfers. We have no experience with taxi rates for this route, but think that a shuttle service with a mini-van between Salzburg and Innsbruck might cost you about 80 to 100 Euros per person and about the same amount if you share a normal taxi among four people. If you are keen on a Southern Germany / Western Austria experience and you travel on a very tight budget, you might want to make Munich or its outskirts your base for exploring both Innsbruck and Salzburg. The Deutsche Bahn, Germany′s national railway, often has really good deals for regional trains. These trains stop in every village and are painfully slow, but the price is often hard to beat - especially if you are not eligible for any other discount tickets (for example, because you are older than 26). If you don′t mind spending a few hours on trains, both Salzburg and Innsbruck are within easy reach. And the triangle between these three cities is extremely scenic and rich in sightseeing attractions.